Yes, you can build a beautiful wood L-shaped desk for under $50 or as little as $75. How? With hollow core doors from your local home store. I got lucky because my local Home Depot was clearancing out these doors so I walked out spending $19.99 each for the 2 hollow core doors that had no pre-drilled holes for the handles. 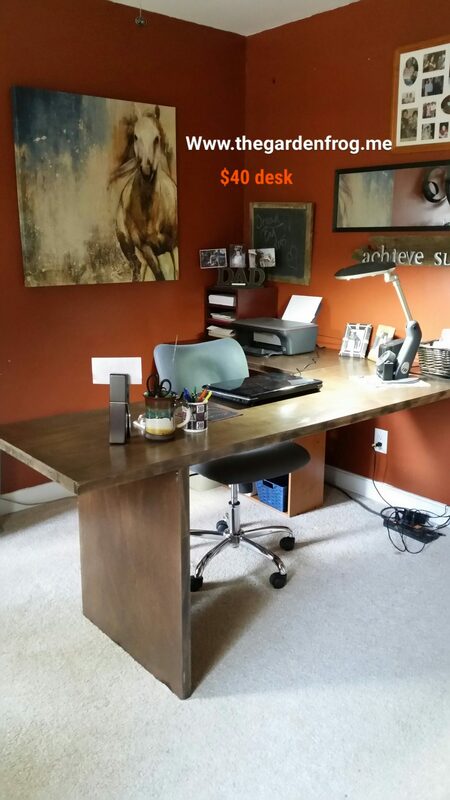 I felt ecstatic to find what I was looking for after hunting at retailers and thrift stores for a wood L-shaped desk for my husband’s new office makeover. Most wooden L shaped desks were over $250 and some as high as $1500! Plus I knew the size and amount of windows and doors in the room limited my choices on desk designs. So I am a ‘think outside the box’ kind of gal. 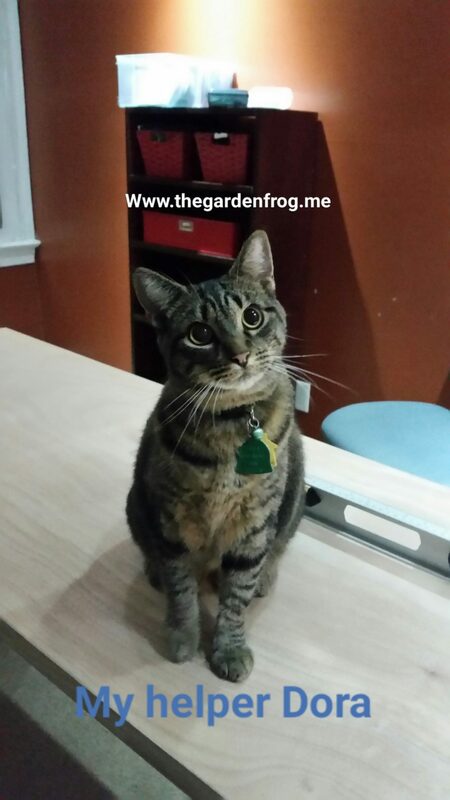 I love creating and building and so I knew I wanted to build a desk for him. Despite my husband’s whining that his old office was okay, I told him that I could not stand his office any longer. It was cluttered, ugly, and a mix of stuff that I did not want in the rest of the house. Even though I do not ‘match’ furniture or pieces, his office was a room I hated to go in. It took me a month and a trip to Home Depot for inspiration (once again) and a walk to the back of the store to see the yellow clearance tag and the (2) 24″ doors just waiting for me to buy. Hubby liked the burnt orange color of the former media room which made the makeover a bit easier. Orange is a cheerful color and has positive qualities such as happiness and intellect which I thought would work for hubby’s home office. I refer to Feng Shui or the art of using color, placement, and energy in a room to help me bring a room together. This room inspired me to build a L-shaped desk that faced the door (from the hallway) and a view of the 2 windows and door to the attic. It is important (in Feng Shui) never to have your back to a door or window. This room took me a month to transform because I had to remind myself this is his office and it took that long for hubby to agree. In my workshop/garage I had most of the stuff I needed so my cost was around $42 to build this beautiful wood L-shaped desk. I have to warn you that if you are obsessive about matching, this may not work for you. Why? because the wood grain on the doors may not match in the L-shaped pattern plus staining I found that the doors did not stain the same dark tone. (I used a walnut stain I had). 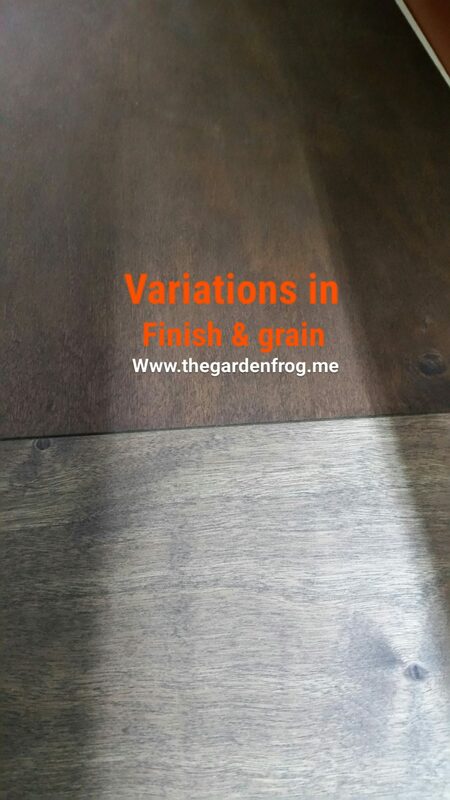 I love the richness of walnut stain and I feel that the dark stain will blend in the other furniture and office accessories that do not match. There is no rule of thumb that states every furniture piece has to match. Go with what you have and if something does not look right, walk around your house and look for something that will. Sometimes that is what I do and my example of ‘shopping’ in my own home was using the canvass horse picture from my bedroon (which I never really liked in there). The horse canvass now really pops in the room. 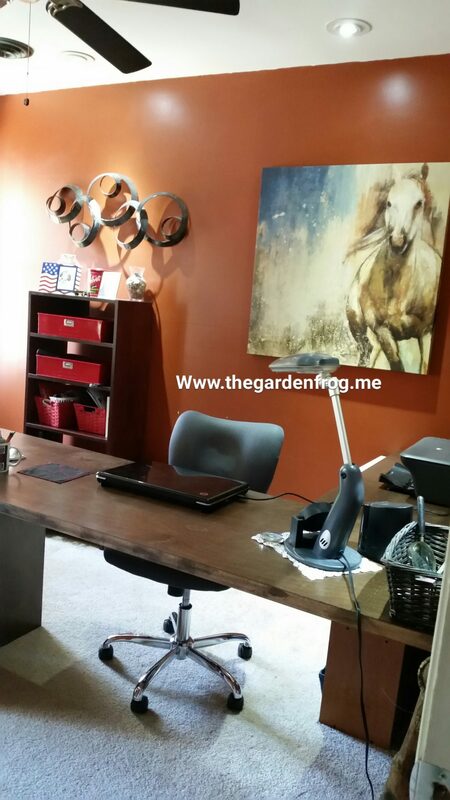 I hope I inspired you with my hubby’s home office makeover. I estimated the $50 project if you have most of the things already in your garage or workshop. 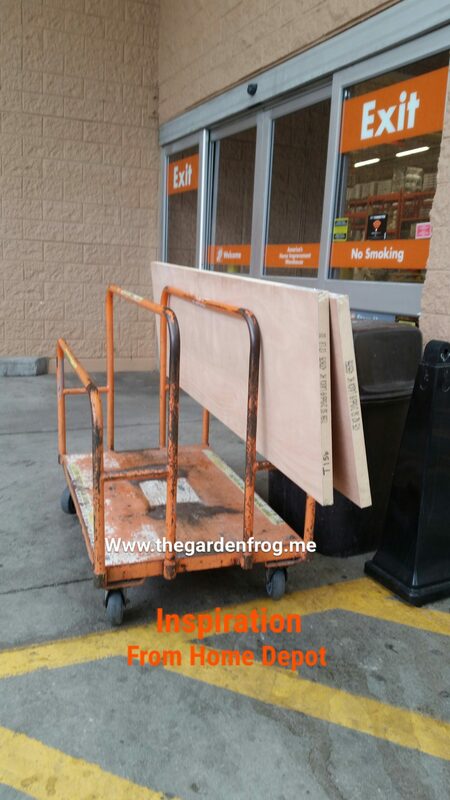 Otherwise if you did not have the doors, brackets, cleat, screws, polyurethane, & stain it would be under $100. Being a one of a kind desk made with love and creativity- priceless.